Detailed decoding of packets, transactions, and other communications is provided in a flexible and easy to understand manner over the field-proven and ubiquitous Ellisys software application. The Overviews are the main display window, and each protocol is provided an its own Overview. Packets, transactions, transfers, and other events are displayed chronologically from top to bottom in a very flexible format. These windows are highly configurable with columns and content that are fully controlled by the user. Instant Filters are provided for standard or user-added columns to create an efficient work environment by reduce the need to search or scroll through unneeded information. Overviews can be stacked, placed side by side, or hidden as needed to create ideal working conditions and enhance visual understandings of Type-C traffic of various types. 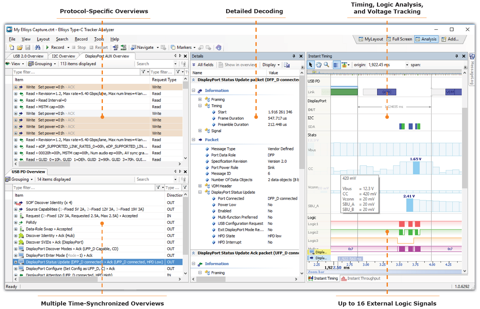 Smart approaches to the display of packets and transactional groupings are provided and are designed to meet the needs of a wide variety of high- and low-level debug and validation tasks. The Instant Timing view is another Ellisys innovation, popular with our users across all our product platforms. 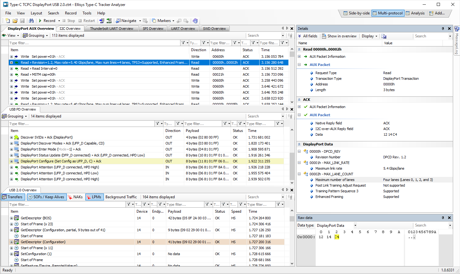 All packets and other protocol events captured by the Tracker are presented in this view with tight precision and with precise synchronization to other views, to other protocols or logic signals, and to USB Power Delivery and Type-C voltage states. A variety of manual timing cursors and fly-over indications are provided. External logic signals can be captured over the Logic / GPIO connection and displayed in discrete formats and in grouped bus formats, in synchronization with all other events captured. Bus throughput information is also provided to assist with characterizations of data transfer issues. Protocol traffic captured by the Tracker is smartly decoded to a progression of levels, from fields to bytes, to raw data. Overview selections are displayed in the Details view, broken down by fields and values defined by the pertinent specification. Selections in the Details view are highlighted in the Raw Data view, which provides options for binary, ASCII, hex and octal views. A variety of export formats are provided for each of these displays. Fields in the Details view can be inserted into the corresponding Overview to define a precise working environment for the task at hand. 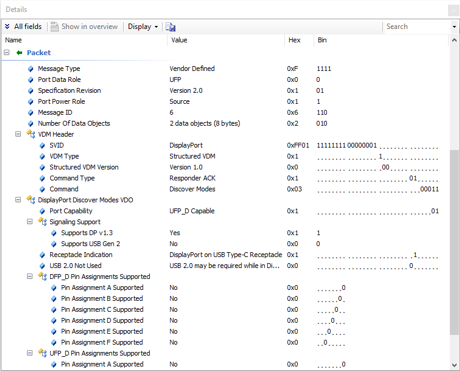 Having one tool to manage several protocols and electrical states over USB Type-C is economical and provides the user with time-saving approaches to debug and validation exercises. The protocols supported by the Tracker can be captured concurrently and visualized in real time with precise timings. The flexibility of the Ellisys software suite allows the user an unlimited number of options to present information, based on the requirements of the task at hand.